Soar through Roatan's tropical foliage and enjoy stunning Caribbean ocean and island views, on an exhilarating experience you will never forget. The zip course of 12 zip lines was really great, staff very nice and helpful. The zip course of 12 zip lines was really great, staff very nice and helpful. My issue: We are happy to tip and we did, but honestly our guide came on a bit strong pushing for tips - way over the top - almost made us not want to tip. We did a city tour, zipline and stopped for a beach day in Roatan. Had a blast. The zipline looked a little "home-made", but seemed safe and was fast! 16 different ziplines. It was wonderful , got to see the little monkey adventure they have there. Weve zip lined a few times, but I think this was the most fun! Weve zip lined a few times, but I think this was the most fun! The guys that went with you were so entertaining! After that, our guide took us to West Bay for some lunch and beach time. It was a great day! These first timers skipped the beginner course and did the extreme zip line adventure. These first timers skipped the beginner course and did the extreme zip line adventure. You’ve gotta try it! Had a blast! There was a four staff members for eight of us. Super friendly! We paid to get pictures at the email, they are supposed to email them to us but we have yet to receive them . Great excursion, either treetop or jungle top. Great excursion, either treetop or jungle top. Really had a lot of great pictures taken and loved all parts of this. Then they took us to a beach. Loved it. I just wished the company charged more so they paid their employees adequately. It really bothers me when employees have to ask for tips. It was an absolutely amazing experience. It was an absolutely amazing experience. The guys helping on the zip line were hilarious. The zip line was definitely a highlight of my trip and the view was breathtaking. Wonderful day in Roatan, better than my previous experience there. Zip lining was absolutely incredible. Zip lining was absolutely incredible. The tour guys were so helpful and charming. They made jokes to help ease your anxiety and by the end of the trip our whole group was laughing and had a great time. First time zip lining. I felt safe and had a great time! The guides were awesome. This was touristy, but actually kind of fun. Son and I had a great time. Son and I had a great time. Very safe, had 10 separate zip line runs. Part of Bodden Tours and Victor&apos;s Monkey Business. Our family had a great time on the zip lines. Our family had a great time on the zip lines. The guides were very friendly. Bodden tours know how to take care of visitors and puts them first. Super fun, exhilarating, great views of the jungle and water. Super fun, exhilarating, great views of the jungle and water. Tony our guide was great! Our favorite excursion!! Beautiful views while zip lining (see photo) and our guides were great!! 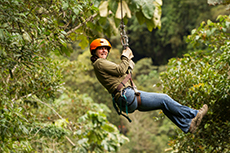 Booked directly with South Shore Zip Lining. Booked directly with South Shore Zip Lining. I think the boat used the same company. We paid $60 pp which included a 2-hour beach break. the boat charged $99 pp without the beach break. Great experience!